In the final great period of the Ice Age, half of Alaska was buried in the ice. Today, about 10,000 years later, five percent remains locked in a frozen world. More than 100,000 glaciers in Alaska continue to shape the landscape in every way, carving mountains, depositing fertile silt in valleys, and crashing into the sea. Once you experience Alaska’s immense and powerful glaciers with all your senses, you’ll discover how truly alive they are. Your eyes take in towering vertical faces of transparent blue ice, icebergs shimmering in the sun, and milky blue-green hues of the sea tinted by glacial silt. The air feels crisp on your skin and fresh as you breathe it deep into your lungs. You can smell the rich minerals of earth and the salt-tinged ocean. The sounds of a glacier may be most startling of all: the tremendous groaning and creaking of constant movement or the thunder and splash of chunks calving into the water. The climatic conditions that form glaciers are ideal in Alaska – regions of high snowfall in the winter and summers cool enough to prevent all of the accumulated snow from melting or evaporating. A glacier grows as the snow accumulates over time, compresses into ice, and begins to flow under the pressure of its own weight. As a glacier nears the end of its cycle, it retreats, dramatically changing the face of the earth it leaves behind. Glaciers are generally grouped into two categories: Valley Glaciers spread out and down as they carve around mountains and down into the sea, and Continental Glaciers, or ice sheets, spread outward in all directions from a central point. Of the basic types of glaciers, spectacular examples of nearly all of them exist in Alaska. Princess’ luxury lodges bring you close to Alaska’s many types of glaciers. Glaciers are a familiar geographic feature of Alaska. There are however, different types of glaciers that vary in appearance. You will see stunning examples of all kinds during your stay. Don’t be startled when you hear loud creaking and groaning. The ice is constantly shifting, forced under its own weight to move the earth beneath! In the vast Alaska Range, including “the Great One” Denali, snow perpetually covers territory above 8,000 feet. Stay at Mt. McKinley Princess Wilderness Lodge and take a summit flight tour by plane or helicopter to see Hanging Glaciers and Mountain Glaciers as they grind down from the peaks, including Buckskin Glacier, Tokositna Glacier, and Kahiltna Glacier, the longest in Denali National Park. Most of the great glaciers, up to 20 and 30 miles in length, flow along the south and west sides of the Alaska Range. Add to your flightseeing thrills by landing on Ruth Glacier, one of Alaska’s most spectacular. Standing 5,600 feet above sea level, you have views of the natural amphitheatre’s granite walls with Denali in the background. The vast silence is broken only by the rumble of distant rock and snow slides. 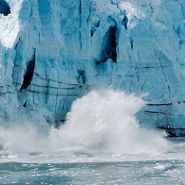 In Southeast Alaska, many highly-active Tidewater Glaciers calve daily, as giant pieces of ice crack off the front of the glacier and fall into the sea. These glaciers can also calve from underneath the water, shooting ice missiles through the surface to fall back with tremendous splashes. Not all of Alaska’s glaciers require planes, boats, or kayaks to reach them. Some of Alaska’s most famous tidewater glaciers are within easy reach of the Copper River Princess Wilderness Lodge. One of the most accessible is Worthington Glacier, where a quick walk takes you right to the edge of the blue ice, through high alpine tundra and postcard-perfect valley views. You might choose to sea kayak in Shoup Glacier and visit Valdez, paddling around the ice bergs in the bay and up to the face of the mighty Shoup Glacier, among the sea birds, seals, and wildlife that hang out on the ice. Marvel at your otherworldly surroundings and listen for the thunder of calving ice crashing into the still waters of the protected harbor. Or cruise Prince William Sound to Columbia Glacier, one of the largest tidewater glaciers in North America. Most glaciers advance mere inches a day, but there are a few that go through periods of huge advance, galloping down mountainsides hundreds of feet daily. For example, the Surging Glacier in Russell Fjord Wilderness takes off once every 20 years or so. More than two-thirds of the surging glaciers on the entire continent are in Alaska. Yanert Glacier surged in 2000 and 2001, then returned to a quiet phase. Today, you can stay at Denali Princess Wilderness Lodge and take a helicopter tour to land on Yanert, or trek past ice falls, crevasses, and glacial streams with a professional guide (outerwear, boots, and crampons provided)! While it’s certainly hard to choose, some of the most memorable adventures take off from the Kenai Princess Wilderness Lodge, including a glacier outback tour, flying over Kenai Fjords National Park to the Chugach National Forest and the massive Sargent Icefield. To capture a true Alaska tradition, take a glacier dogsled adventure, landing on the Sargent Icefield by helicopter. Learn about the art of mushing and ride on a dog sled across the snowcapped glacier. Nearby Exit Glacier, on the Harding Icefield, is another wonder that can easily be reached on foot. On an organized excursion, it’s handy to have expert guides to guide you safely through your glacier adventures and teach you interesting facts, such as that a single ice crystal in a glacier can reach the size of a baseball, or that glacial ice appears a startling blue in color due to how light waves pass off and bounce through the thickest ice. Wherever you stay, the chill of the glaciers is in direct contrast to the friendly warmth of Princess’ Alaskan Outfitters, people who bring the benefit of local experience combined with the Princess touch of impeccable service. They are a wealth of information and you should call upon them for restaurant recommendations, shopping tips, optional sightseeing tours, and to inquire about points of interest. Their goal is to help you explore Alaska’s glaciers-and the real wilderness and historical cities of this bountiful state – your own way.